Frugal and Thankful: 30 things in 30 days. Update #1. 30 things in 30 days. Update #1. So since I skipped the "Frugal Fridays" I'll just do a quick update on our financial situation. Unfortunately, there is not much we can do about the crazy bill we received due to an agreement between the hospital (or medical group) and an insurance company. We will try to lower it a little bit but that's the most we can do. It' frustrating to think about it but at least most of it goes towards our deductible (which we will reach this year anyway). But yesterday we got an unexpected reimbursement bill in the amount of $325, and it will greatly help to outweigh what we owe. And now to my little challenge of the month :) You might remember that in August I wanted to get rid of 30 things. I made a small dent this week. I did not donate, throw away or give away anything yet. Why? Because one of my friends decided to have a multi-family yard sale next Saturday and offered me to be a part of it. I don't have that much to sell, mostly smaller stuff, I would never have enough for my own sale. But it will be nice to have my own table at her sale, and, hopefully, I can make an extra dollar or two. I have 22 things on my for sale list so far, so even if I sell only half of it, it will still help me a lot with my goal. 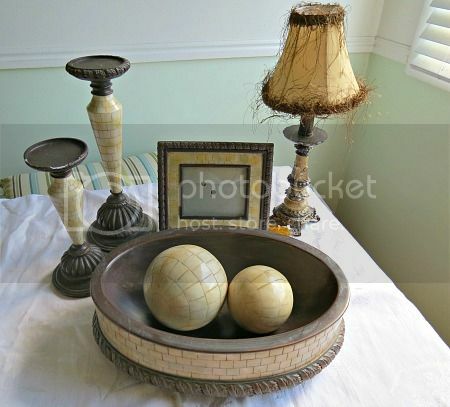 I got it about 6 years ago for $25 and all I wanted from it was the bowl with balls (I only used that and also the candlesticks). It was somewhat my style back then... My taste changed a lot since and I had no use for it any more. I listed and sold it for the same price on a Home Decor Facebook yard sale and, honestly, I could ask even more because it got quite a bit of interest but I'm happy at least to make back what I spent in the first place. So, update #1: 9 out 30. And how did you do?? I love the little set that you sold, cute! People can be rude no doubt about it! I read about the woman that touched your belly- I never minded if people did with a kind comment. But I also never had a stranger do that to me! Good grief ! You are a kind soul Lena, take care! I'm sorry about the hurtful comment. Please know that is just one persons opinion & you have many readers who care very much about you & your family. I am very glad you did not decide to stop blogging. I have gotten rid of a lot of things this month, but I'm not trying to sell anything, so it's much easier. Charity has picked up three boxes of things and I will soon have another trunkful to drop off. I've also filled my shredder three times with papers I've been sorting. I'm not that big of a shopper and try to get rid of things on a regular basis, so I'm always amazed at how much stuff I have. Hang in there. We love you girl. If you shut down your blog, I would really miss it! People say things on the Internet that they would never say to someone's face. They are cowards and they can be quite rude. It is a problem with them and NOT with you, but it is still hard to take. Whatever hasn't sold on eBay,( 3 toy metal cars,VW,) vintage lunch boxes , Star Trek figures (small 5 inch) are on it's way to cancer thrift store. That's a total of 10 things, plus a small bin, some clothes. I'll have 30 by next weekend, and I'll just keep going. I don't take anything good or vintage to goodwill anymore because of the hoards of ebay resellers, trying to find a deal to re sell. If anyone thing bugs me ( well, tons of things bug me), it's seeing those people load up their carts,with stuff that they will resell. I mean I remember in the old days of thrift shopping I would be thrilled to find a treasure to take home. Now you can't find anything because it's been picked over by buzzards. Say don't read it. I've stopped reading a few peoples blogs either because of all the ads popping up , or some over the top religious stuff. So...keep blogging. I like your blog. I am glad you have decided to keep blogging :) I would miss reading your blog if you decided to stop. As for the giveaway challenge...I sold a couple of boy clothes and dvds this week on facebook for a total of $10, but other than that not much going on. I did start working on my own clothes closet last night and pulled at least 10 things down to either try to sell or donate. Uffff Lena for a minute there I thought you were going to stop blogging!! I would miss you! Although I can't comment as much as I would like on your posts I do read them and enjoy their versatality as you veer from one subject to another. I also admire your frank and realistic approach! As others have said here don't bother with the people who appear to enjoy negativity and just "brush them away under the carpet" . It is hardly worth worrying about! Your response to that comment was, in my opinion, very thoughtful and well-mannered. I'm not so sure I would have been. Keep on keeping on Lena, don't let someone else's opinion change your beliefs. We fought for freedom in this country and we shouldn't be silenced with our beliefs, but certainly we can all be civil about it. You are a class act. :)! I commend you for continuing to blog. A hurtful comment would probably do me in. I did receive one once, and while there's other stuff that has severely slowed down my blogging... it's still always in the back of my mind. I'm almost scared to check comments for fear of a negative comment... stupid, I know. I've been in a big purge mode lately but having all three kids at home for the summer is really slowing me down! But bit by bit it's leaving the house. Mostly by donation (Purple Hear picks up at your home once a month) or throwing away (if it's the only option of course!). I'd love to be making more money, but it just takes too much time. So, at least it's out of the house if nothing else! your kind words and kind soul are missed. I love reading your blog. Some people just have to make others feel small to make themselves feel big. One of my favourite sayings is " you can't control what others say or do, but you can control what you do" Don't let anyone get the better of you. You have so many people ( me included) who truly look forward to your blog. Keep it going!! Best of luck to you and your family. God is good.